A 55 yo female with compressive myelopathy clinically. 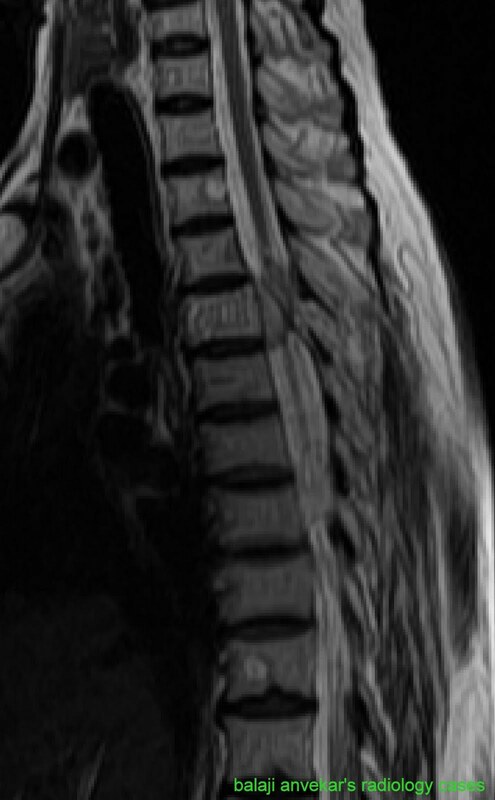 D2 vertebral body and adjacent posterior elements show an abnormal altered marrow signals, heterogeneously hyper intense on T2 and STIR with low signal intensity vertical striations on sagittal sections, multiple punctate low signal intensity dots on Axial T2w sections so called as 'Polka dot' appearance corresponds to coarse, thickened vertical trabeculae characteristic of Spinal Osseous Hemangioma. An associated anterior epidural lentiform shaped soft tissue causing canal stenosis, anterior displacement of cord with significant cord compression. Imaging wise diagnosis : Aggressive vertebral Hemangioma. Gross Appearance : The specimen consists of grey brown soft and largely bony fragments together measuring ~ 25x14mm. Representative sections are submitted for processing after de calcifying bone. Microscopy : A benign neoplasm composed of vascular tubes or spaces lined by endothelium and many containing blood. The interstitial tissue contains a couple of spicules or trabeculae of bone. Histopathological Diagnosis : Spinal Intraosseous Hemangioma. Vertebral body hemangioma are usually benign looking and asymptomatic. Rarely aggressive and pt may present with cord compression due to an associated epidural soft tissue as in this case.